Here I was hoping to have an in-depth discussion of solutions! But no...not here. How disappointing. I'm honored to be featured in Parade Magazine today, along with an excerpt from my book! I'm often asked if things have improved for women on fire crews. Here's just one more testimony I found today in Dame Magazine that the answer is: NO. I found this video on Facebook, and while it is funny, it's also sad and frustrating. I highly recommend you watch it to the end. The interview with Anita Hill is quite interesting. I'm honored to be a guest on Nancy Julian Kopp's blog today, talking about writing the truth in memoir. I'm pleased to be featured on Dr. Lynn Schmidt's website today, writing about finding resilience. Join me on Women On Writing where I give pointers about how I made book marketing easier. 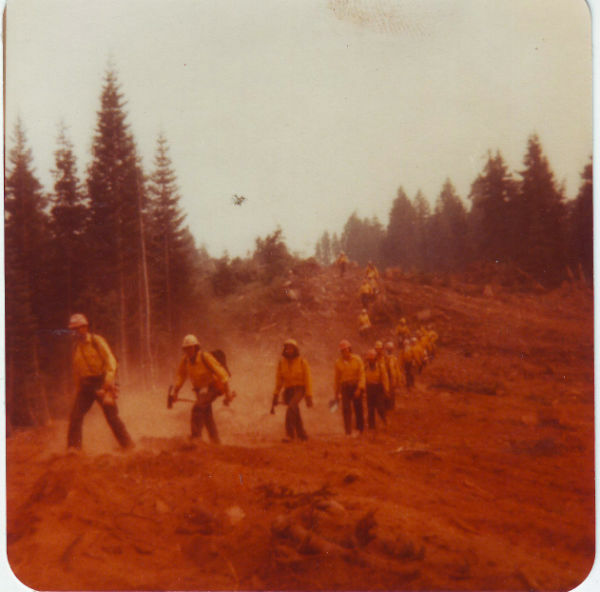 What is it about firefighting that made me love my work? I just read this post on Facebook today, and it brought tears to my eyes. I recently saw a post asking what being a wildland firefighter means to people. This to me is what it's about. The camaraderie you have with your crew. The nights spent out at a remote spike camp, sitting around a campfire after a long shift talking like you haven't been around each other 24/7 the whole summer. Jokingly complaining about how awful the line, food, coffee or hike in or out was, but looking back and being satisfied with the progress the crew has made. More and more I feel like firefighters are being told they're glamorous, adrenaline fueled heroes doing an extremely dangerous job, battling the forces of nature and more and more inexperienced firefighters are believing it and thinking that's what this job is about. It's sad and about as far from the truth as you can get. It's all about teamwork, camaraderie, and a few clear, calm decisions to solve evolving problems. I couldn't have said this better. This is what I miss. This is what made my job special, and far more than just a job to me. This time in my life was the only time I felt that way. There is no doubt I am quite lucky to have had those experiences. This has changed since I worked on a crew. We did not post a lookout, or set up a safety zone, both important safety features now in place. I'm thrilled to have been reviewed in my local paper yesterday! 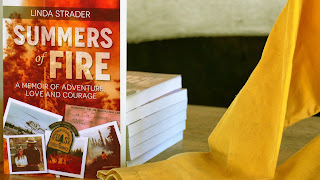 Summering at the rustic Florida Ranger Station in our Santa Rita Mountains may sound ideal to some of us Southern Arizona desert dwellers, but surely not if we had to fight fires and clear heavy tree limbs up and down the steep slopes! 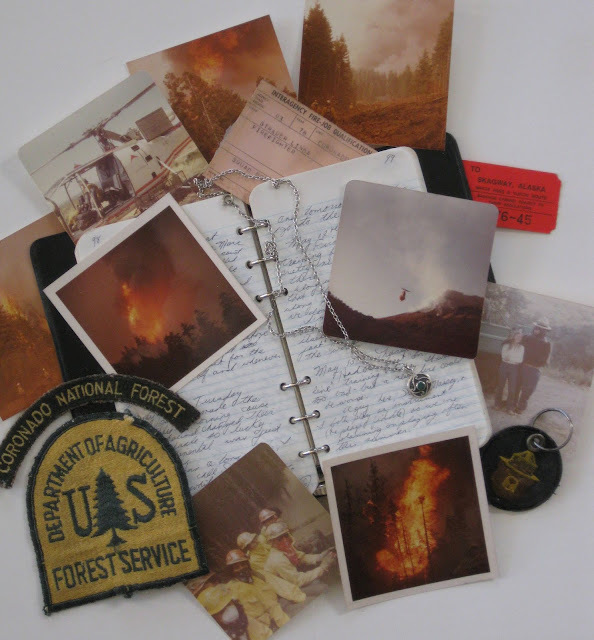 But it was a dream come true for 20-year-old Linda Strader when in 1976 she began seven years of seasonal work with the U.S. Forest Service and Bureau of Land Management. 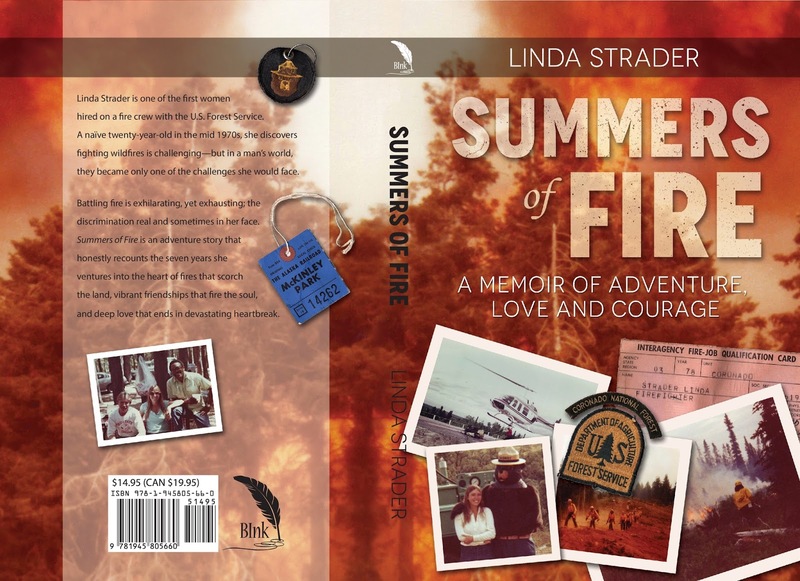 Kudos to Strader for pursuing a career as a firefighter in the 1970s and early '80s, and persevering as one of the first women hired on a Forest Service fire crew. No easy task in a male-dominated profession. 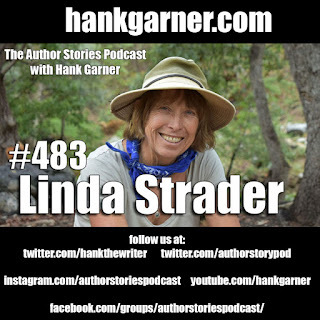 From the Santa Ritas to the Santa Catalinas, up to Flagstaff, then in Alaska and Colorado, Strader shares it all: the excitement, hard work and danger; the camaraderie and her love interests; and her tremendous personal successes and hard knocks on the job and in her personal relationships. As a first-time author, Strader's writing is insightfully descriptive, from nature's wonders and brutality, to times when she survived only on sheer willpower, truly pushing herself physically to the brink, and the rewards she found working in the great Western outdoors. Strader cites support from several local writers and her friend, advisor and writing coach Joanne Burch. She put their advice to good use. 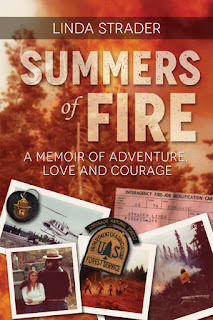 This well-written memoir will have readers caught up in the adventurous twists and turns to very end. My first professional review! I am feeling quite proud. NO, I am NOT changing that! I like it this way. But do you need to listen to suggestions, or ignore them? I’ve learned over the years I spent perfecting my story, that refusing to make edits may hinder or prevent a better book. In fact, that is one big reason why publishing traditionally worked for me. Had I been the one to make the decision alone, or based on a few reader comments, I would have published long before it was ready. After my memoir was published, I started beta reading (reading final drafts for fellow writers, and offering advice on story flow, construction, and looking for typos, minor grammar issues, etc.) Many have been wonderful to work with, and even remained in contact with me. I have no problem with writers who choose to ignore my suggestions. That’s their prerogative. But what really upsets me, to the point that I am tempted to refuse to help, are the people who retaliate with nasty comments, or who say absolutely nothing. How hard is it to simply thank me for my time, even if you don’t agree with my feedback? Hey, I get it! It’s downright hard not to get defensive about your work-in-progress. After all, you slaved over it for hours, maybe into the wee hours of the morning, editing, perfecting…reworking it the next day, the day after that, for weeks, even months! The thought of handing over what you wrote for feedback is terrifying. Will they hate it? Will they think you can’t write your way out of a paper bag? However, there comes a point when you are going to have to let someone else see your work—unless you intend to be the only person that ever reads what you wrote. What fun is that? My beta reading experiences have been varied. While many writers are open to comments and suggestions, inevitably one comes along that gets angry with me when I tell them they need to work on some serious issues. For example, a woman wrote about a traumatizing event in her life as though she was narrating a movie. When I explained (and offered examples) the idea of ‘show don’t tell’, she became defensive and told me that she ‘knew’ that, but wanted me to read all 75,000 words anyway. I had to pass. However, I kindly told her that if she reworked two chapters per my suggestions, I’d be happy to reread. Her response was loud and clear: Crickets. This hurt. After all, I was just trying to help. I reached out and apologized. She ignored me. It took me a few days to convince myself I’d done nothing wrong. This upset me enough that I stopped accepting drafts for a while. A few weeks later, though, I offered to beta read a mystery. Only two pages in, the dialog was so horrendous, I just couldn’t continue. “I never told you that,” Frank said. “Yes you did,” Doris said. “No, I did not,” Frank said. “Well that’s what I remember,” Doris said. “You have a bad memory,” Frank said. “I do not,” Doris said. I edited a page, giving him examples of how I learned to write effective dialog. His response? Again, I suggested he revise two chapters and resend so I could see if he was getting the hang of it. He refused, complaining that all he wanted was someone to read to the end. 1. Stay objective. It is unlikely that someone reading your work to provide feedback is out to make you feel incompetent. We do enough of that on our own. 3. Let the feedback sit for a day or two to calm down. Is the comment valid? Only you can be the judge. If it is valid, make the change. If your gut is screaming ‘No!’ then don’t. 4. If feedback is simply “I love your story!”—That’s not particularly helpful. Even though it feels great, what you need to know is why they loved your story, something you can learn from and expand upon. 5. It can be hard to separate criticism of your work from criticism of you as a person. You need to remember you are not your writing. My experience has been that most fellow writers want you to succeed and want to help you. That’s why I am willing to share what I’ve learned with new writers. However, don’t be the defensive stubborn mule and chastise the reviewer for feedback you didn’t want to hear. Please keep in mind that beta readers have feelings, too. What a nice time I had at the Barnes and Noble book signing event! The B & N store manager announced me twice over the 2 hours, which sent people over to my table. I met some wonderful people and sold 8 books, including two to a father who wanted his young daughters (who were quite polite and asked me interesting questions, I must add) to read my story. He also said he wanted them to be sure to share what they learned in school. They even shook my hand and told me what a pleasure it was to meet me. Wow. Next, a young woman came to talk to me. She told me she was in training to become an EMT. After talking for a while, she picked up my book and read the back. "You were 20 when you started? I'm 20..."
She bought my book and said she needed to think about the possibility of trying out wildland firefighting. Excellent! Finally, when I was ready to leave, the store manager expounded on how wonderful he thought my book was, and that he wanted me to sign 10 remaining copies to put on their shelf for autographed books. How exciting! Wildland firefighters have always carried far less gear than those who work for city fire departments. There are at least two reasons why. First, wildland fires are usually in remote locations, requiring either long hikes, helicopter transport, or parachuting in. All of these methods require that weight and gear are kept at a minimum. Second, unlike a structure fire which might take hours to put out, forest fires can takes weeks, if not months, to be considered truly “out.” Carrying enough supplies for that long of a period is impossible. My first fire season in 1976, protective gear consisted of only a shirt made of fire resistant Nomex fabric, goggles to protect our eyes from debris, a metal hard hat (even though lightweight fiberglass was available, it wasn’t melt-proof), leather gloves, and leather work boots with a minimum 8” top and no steel toes. Steel-toes were not allowed because if you stepped into a bed of hot coals, the steel would transmit the searing heat to your feet, and would continue to do so even after you moved, resulting in serious burns. 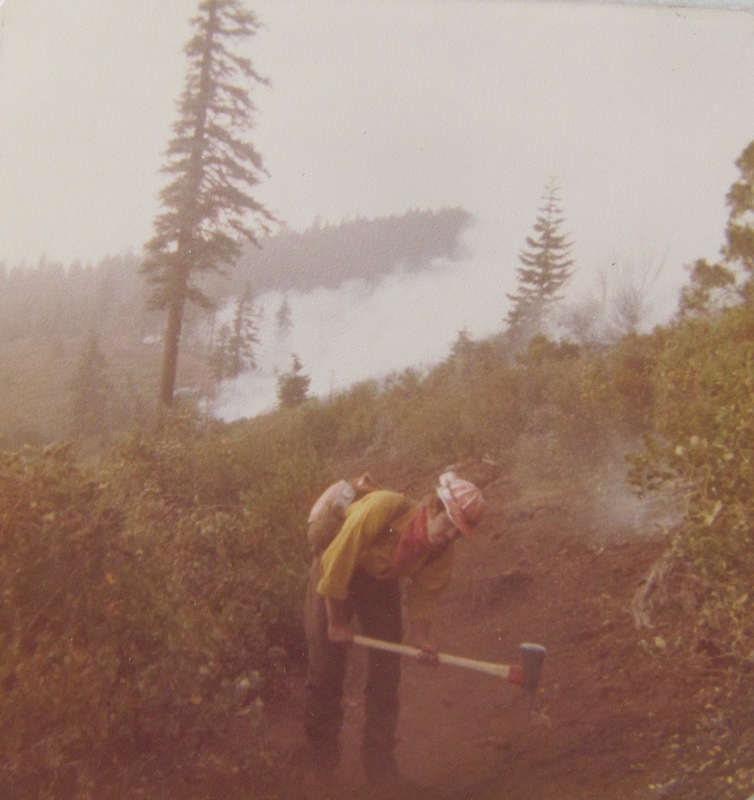 It wasn’t until 1977 that wearing both Nomex pants and shirts became mandatory even when not working on a fire. No one on my crew, including me, wanted to wear Nomex clothes because they didn’t breathe well in the summer heat, but we had no choice. Also introduced that summer, was the first fire shelter, which we also protested. Not only did we not want the extra weight, but we didn’t believe they would work. Because of the 2013 tragedy of the Granite Mountain 19 Hot Shots, where 19 men all died while in their shelters, new fire shelters are now under development. However, the prototypes are a problem. For shelters to be more effective, they would weigh far more than anyone would want to, or could, carry. Most firefighters interviewed about whether or not they would carry these new shelters say they would not, and would prefer to take their chances with the older version. Firefighting hand tools used then remain the same ones used today: The Pulaski, shovel, McLeod, and backpack pump. The Pulaski, invented by the early forest ranger, Ed Pulaski, is a combination hoe and axe. Weighing in at about 8 lbs, this tool is often the preferred fireline building tool because of its multi-functionality. A firefighter’s shovel is not an everyday garden shovel. This version has a shorter handle to make it just as useful to scrap the ground to remove flammables as it is to shovel dirt. To further set it apart from a garden shovel, the lip is sharp in order to cut small roots when clearing line. A McLeod is a heavy-duty rake with a broad hoe opposite the tines. This tool is best for scraping pine needles and the duff underneath, limiting its usefulness. The backpack pump (aka bladder bag, piss-pump) is handy for putting out hotspots, but a royal pain in the rear to carry, especially in steep terrain because the water inside wants to follow gravity, pulling you downhill, making walking on steep terrain a challenge. While not a hand tool, I’m often asked about slurry, also known as fire retardant. Slurry is basically a mixture of water and fertilizer used to aid in fire suppression. What many people don’t understand is that slurry does NOT put out a fire. Its main purpose is to dampen flames in order for fire crews to be able to move in closer and build line. Without hand crews ready to jump in, the water evaporates quickly, and the fire moves on to new fuel. 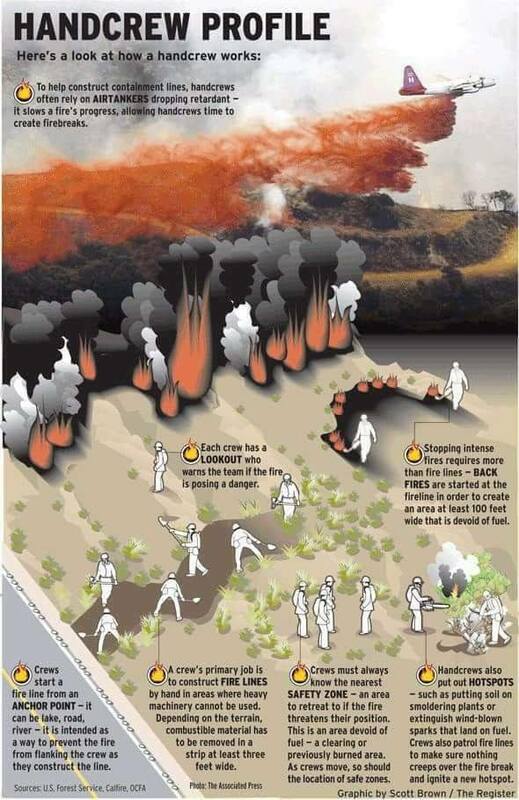 The purpose of the fertilizer is solely to aid in the regeneration of new growth after the fire is out. I knew there were other options, such as self-publishing (where you bear all of the publishing expenses) or hybrid publishing (where you share in the publishing expense). However, in both of these cases there is a huge financial risk. You may not ever come close to recouping your investment. Frankly, I could not afford to do either of those options. Because I wanted to stick with traditional publishing, I took a different approach. I decided to look into small publishers (aka small presses). MYTH #1: Small publishers require agent representation. No, they do not require that you have an agent. MYTH #2: You won’t need a professional query letter or book proposal. Just like with agents, you will need a query letter and you may need a book proposal. MYTH #3 Small publishers will charge a reading fee. MYTH #4 You will have to pay to publish with a small press. If they ask you to pay, this is not a traditional publisher. While the publishing world is changing, at this point in time, publishing with a small press does not cost you a dime. MYTH #5 Small presses don’t do anything to help you market your book. The reality is no matter how you publish, you will be involved in the marketing process. How much your publisher participates requires investigation. Ask them questions. OKAY, SO HOW DO YOU FIND A SMALL PRESS? 1. Querytracker.net has both agent and small press listings. It’s a free service, and the website keeps track of queries for you. 2. Another great resource was Poets and Writers. (pw.org). This is where I found my publisher. 3. University Presses. They often have narrow interests, but if your book fits, why not? ALWAYS read requirements for submission before sending a darned thing! Just like with literary agents, the requirements vary. I found that 50% of the agents and publishers I queried wanted a book proposal. Be prepared. You don’t want to be writing a 40 page book proposal at the last minute. How do you know if the publisher is legit? 1. Ask to see the boilerplate contract. A Google search will provide all kinds of articles to read about red flags in contracts. 2. Ask if the terms are negotiable. Can you delete, amend, or add clauses and/or change royalty rates? If a publisher says s/he doesn't negotiate, you've got a big red flag. 3. Look at the books they're publishing. Do they look professional? Or cheap and poorly designed? Trust your instincts here on what does or does not seem quite right. A. Are books for sale on Amazon and Barnes and Noble.com? Verify by checking the list prices. B. Are the books listed at Ingram and Baker & Taylor? If they're not, your chance of getting into bookstores and libraries other than as a special order is practically zilch. 5. What about book pricing? Are trade paperbacks over $15.00? Overpriced books are a problem. 6. How long has the publisher been in business? You do not want to be first. Even being in business less than five years is not good. This industry requires many years of experience to do things right. 7. Does their website focus on writers or readers? A publisher should be focused on books. If the website is more about how to become one of their authors, how to query etc, that's a problem. All were quite willing to share experiences. I had two small publishers make an offer on my memoir. After carefully evaluating each one, and corresponding with some of their authors, I chose Bedazzled Ink. It had been a dream of mine to land an agent, but it didn’t work out. However, it had also been important to me to publish traditionally, and I did. I’m pleased with my book cover design, but felt the editing process could have been better. Only time will tell about the marketing aspect. Despite those issues, I still would not have published any other way. My advice is no matter what route you decide to take, don’t give up. I think many authors give up too soon. It’s not an easy road to publication, but with determination and persistence, it IS possible.